Two recent announcements signal good news for Capital Region trail users and residents, with funding approved for the expanding Champlain Canalway Trail and a study underway of potential on-road connections to a well-used section of the Erie Canalway Trail. In Saratoga County, the Board of Supervisors recently approved a plan to divide the County’s overall trails budget, approximately $100,000, equally among eight applicant communities. Final approval was announced at October’s Board of Supervisor’s meeting, with Board Chair Matthew Vietch commenting that the quality of all the proposals received . The $12,500 awarded for each project will be matched by the local applicant. 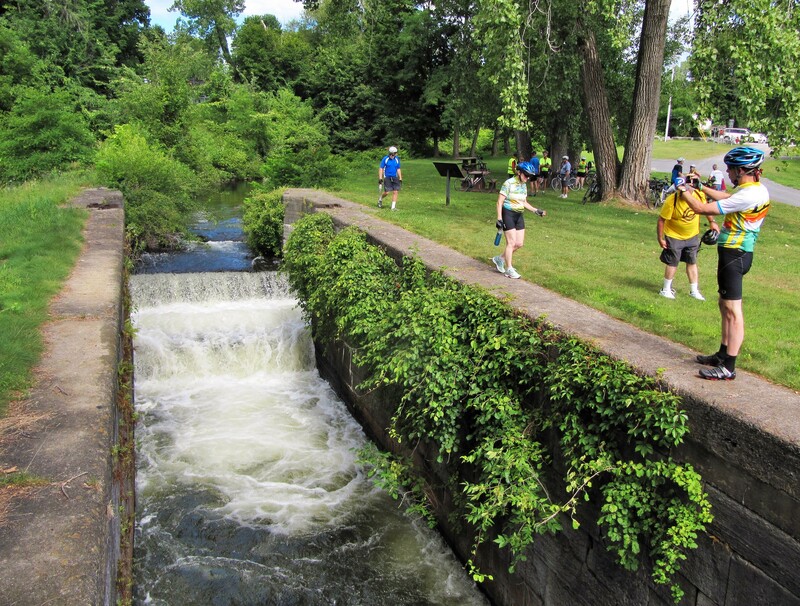 The towns of Halfmoon and Stillwater have pledged to use their portions toward constructing pieces of the Champlain Canalway Trail, which will follow the historic canal from Whitehall to Waterford. Stillwater will fund a 1-mile path connecting a section of the Champlain Canalway Trail to Saratoga National Historical Park, and Halfmoon will use its funding for a .37-mile section of the Champlain Canal Trail. Mechanicville plans to use its share of the funding to study the extension of the Zim Smith Trail to the Hudson River waterfront and the future Champlain Canalway Trail. In the City of Albany, a study has been funded to propose connections between a new trail, the Albany County Helderberg-Hudson Rail Trail, and the well-used section of the Erie Canalway Trail (Mohawk Hudson Bike-Hike Trail) in the Corning Preserve. The Waterfront Bikeway Connection Feasibility Study is part of the Capital District Transportation Committee’s Community and Transportation Linkage Planning Program. The study’s proposed South End Bikeway Link, recommends various on-road treatments for the 1.5-mile gap between the two trails which will allow cyclists and walkers to more safely access both the ECT and the Helderberg-Hudson Rail Trail thereby giving local residents and visitors non-motorized access to Albany’s Hudson River waterfront and downtown. The study is important because it demonstrates the relationship between on-street, often-urban cycling facilities – such as protected bike lanes – and multi-use trails such as the statewide Erie Canalway Trail (ECT). In many cases, the lack of a mile or less of on-street facility prevents would-be cyclists from accessing many miles of safe, off-road trail.